Among the many things I love about running Boston Mamas independently is: a) how nimble I can be when inspired by a plan, and b) having created community based resources such as the Boston Mamas mamapreneur network. Last month, I brought these two elements together to launch the Boston Mamas Have a Heart for Haiti campaign, and I'm thrilled to report that we rocked it for Haiti and raised $1,850! 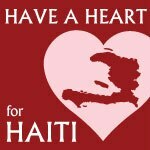 This donation has been directed to UNICEF, which is absorbing administrative costs so that 100% of every dollar donated goes directly to relief efforts for children in Haiti. I am so grateful to all who shopped and helped spread the word, as well as to the amazing vendors who were so generous in their participation (I’ll be sharing the top fundraiser in a separate post). I hope you’ll keep all of these women business owners in mind for future shopping. And also huge thanks to Kristen Chase, who is based in Atlanta but donated 15% of book sales from The Mominatrix Boston event to this campaign. With gratitude to the phenomenal folks at Magic Beans and Isis Maternity who served as promotional partners to help get the word out!